The 2nd edition of the World Bridge Series, held in Amsterdam in 1966, was the occasion to introduce a mixed pairs event contested by 130 pairs. 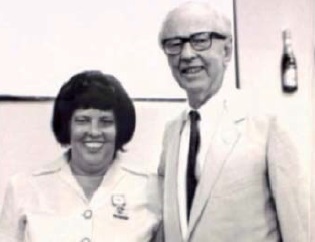 Mary-Jane Farell and Ivan Erdos from USA, were the first champions. 1. Franck Multon (Monaco) – Sylvie Willard (France). 2. Petra Hamman – Hemant Lall (USA). 3. Benedicte Cronier – Philippe Cronier (France). 1. Kerri Sanborn (USA), Zhao Jie (China). 2. Meike Wortel (Netherlands), Jacek Pszczola (USA). 3. Wang Nan, Zhang Bangxiang (China). 207 Pairs entered for the Mixed Pairs Championship. 1. Donna Compton & Fulvio Fantoni. 2. Kismet Fung & Brian Glubok. 3. Joan Lewis & Robert Hopkins. The Mixed Pairs attracted a field of 432 pairs, who competed in three qualifying sessions, the top 156 pairs surviving to the three-session final. In winning the title Fulvio Fantoni became the second player ever to win five different world titles after Bobby Wolff (Bermuda Bowl, World Games Open Teams, World Open Transnational Teams, Open Pairs, Mixed Pairs). 1. Karen McCallum & Matthew Granovetter. 2. Jill & Bobby Levin. 3. JoAnna & Lew Stansby. The Mixed Pairs attracted a field of 481 pairs, who competed in three qualifying sessions, the top 182 pairs surviving to the three-session final. The remaining pairs (232) were able to enter the Mixed Pairs (consolation) Plate. 1. Irene Baroni & Enriquo Guerra. 2. Danielle Avon & Jean-Michel Voldoire. 3. Catherine Ritter & Sartaj Hans. 1. Becky Rogers – Jeff Meckstroth (USA). 2. Elisabeth Hugon – Jean-Jacques Palau (France). 3. Sabine Auken – Jens Auken (Denmark). 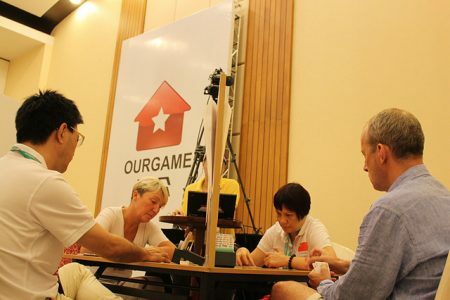 434 pairs contested the Mixed Pairs Championship with three qualifying sessions, and then the final was played as seven sections of 13 tables, a total of 182 pairs. 1. Enza Rossano – Antonio Vivaldi (Italy). 2. Claude Blouquit – Michel Bompis (France). Nearly 600 pairs contested the JM Weston Mixed Pairs Championship, with 260 going into the final. 1. Danuta Hochecker – Apolinary Kowalski (Poland). 2. Sabine Zenkel (now Auken) (Germany) – Bob Hamman (USA). 3. Eva Harasimowicz – Marcin Lesniewski (Poland). More than 500 pairs entered the six-session NEC Mixed pairs. The field was cut to 180 pairs after three sessions. 1. Juanita Chambers – Peter Weichsel (USA). 2. Eva-Liss Göthe – Lars Anderson (Sweden). 3. Walt and Kathie Walvick (USA). The opening four sessions were devoted to the Nestlé Mixed pairs and yet again the USA proved to be successful with Juanita Chambers and Peter Weichsel winning comfortably. 1. Pam Wittes – John Wittes (USA). 2. Kerri Shuman – Bob Hamman (USA). 3. Rozanne Pollack – Bill Pollack (USA). In the curtain-raising Mixed Pairs event, USA took the first three places. 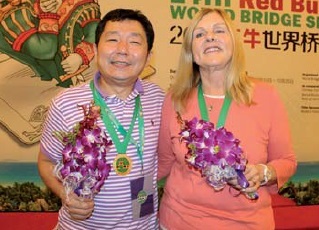 Canada won its very first World Bridge Championship when Dianna Gordon and George Mittelman, both from Toronto, led home a record field of 450 pairs in the Mixed Pairs. Second by half a top were the husband and wife combination, John and Peggy Sutherlin of the USA and third were Mr. and Mrs Viennois (France). 1. Barry Crane – Kerri Shuman (USA). 2. James Jacoby – Heiti Noland (USA). 3. Lou Bluhm – Carol Sanders (USA). The Mixed Pairs, dominated by the USA, featured an impressive performance by the late Barry Crane, who some considered the world’s most effective pairs player, and Kerri Shuman (now Sanborn). They won the four session contest by more than 3 1/2 boards. The Mixed Pairs was won by Tony Trad and Loula Gordon of Switzerland. The Mixed event, contested by 228 pairs, saw a remarkable performance by a player who 40 years earlier had contested the very first international contract bridge matches between a Bridge World team and Britain and France, who had been an outstanding player of auction bridge before contract was even invented. Aged 74 and troubled by poor sight, USA’s Waldemar von Zedwitz headed the field in the partnership with Barbara Brier (picture). Second was a Great Britain/Switzerland combination, Rixi Markus and Georges Catzeflis. Third were Riva Sinder and Michael Hochzeit of Israel. Von Zedwitz’s service to the game of bridge as a player, administrator and theorist was later recognised by his election to WBF’s Committee of Honour. The Mixed event was contested by 130 pairs and Mary-Jane Farell and Ivan Erdos (USA) won the gold medal, followed by Joan Durran and Maurice Weissburger (Great Britain).